Thermal 4π electrocyclic ring openings of cyclobutenes to form butadienes are known to proceed in a conrotatory manner, consistent with the Woodward–Hoffmann rules. However, there are two different conrotatory modes which can lead to isomeric products if the cyclobutene is suitably unsymmetrically substituted. Torquoselectivity refers to selectivity arising due to the preference of one conrotatory mode over the other. The Houk group has reported some examples of counterintuitive 4π ring openings1,2 (simply considering steric interactions, the larger group generally wants to move outwards). In both cases only one isomer of the product is formed. Why is this selectivity seen? 1. Houk, K. N.; Spellmeyer, D. C.; Jefford, C. W.; Rimbault, C. G.; Wang, Y.; Miller, R. D. Electronic control of the stereoselectivities of electrocyclic reactions of cyclobutenes against incredible steric odds. J. Org. Chem. 1988, 53 (9), 2125–2127. DOI: 10.1021/jo00244a058. 2. Rudolf, K.; Spellmeyer, D. C.; Houk, K. N. Prediction and experimental verification of the stereoselective electrocyclization of 3-formylcyclobutene. J. Org. Chem. 1987, 52 (16), 3708–3710. DOI: 10.1021/jo00392a047. The torquoselectivity of the above reactions is dictated by stereoelectronic effects, which (in this case) are significant enough to take precedence over steric effects. In general, electron-donating substituents (e.g. OMe, OTMS, ...) prefer to move outwards, and electron-accepting substituents (e.g. CHO) prefer to move inwards. A brief explanation is as follows. As the reaction proceeds, the C–C σ bond in the reactant is stretched, and consequently the σ* orbital is initially strongly destabilised (its energy increases rapidly). At a certain point near the transition state, though, it becomes sufficiently close in energy to the π* orbital such that orbital mixing can occur; this mixing leads to stabilisation and eventual "evolution" into the HOMO of butadiene. Therefore, in the transition state, the HOMO is mostly σ-like, and the LUMO σ*-like; this was also verified computationally (details in ref 2). These frontier orbitals are of the correct symmetry to interact with pi-type orbitals of substituents. For donor substituents such as OMe, these orbitals are filled (lone pair on oxygen); for acceptor substituents such as CHO, these orbitals are empty (low-lying C=O π*). The dashed orbitals in the following diagram represent the positions of these orbitals in the TS for both cases of outward and inward rotation. In the case of outward rotation, the substituent orbital can only interact with the lobe on C–3 which is in close spatial proximity; however, in the case of inward rotation, the substituent orbital can interact with the lobes on both C–3 and C–4. In general, the interaction of a filled orbital and an unfilled orbital leads to stabilisation, whereas the interaction of two filled orbitals leads to destabilisation. The torquoselectivity is determined by maximisation of the former and minimisation of the latter. If the interaction with the lobe of C–4 leads to destabilisation, then inward rotation will be disfavoured, and vice versa. Inward rotation decreases the stabilising interaction between the donor orbital and the LUMO of the TS, as the lobe on C–4 is of the opposite phase as the lobe on the donor orbital, which leads to poorer overlap between the two orbitals. Inward rotation increases the destabilising interaction between the donor orbital and the HOMO of the TS, as the lobe on C–4 is of the same phase as the lobe on the donor orbital, which leads to stronger overlap. Interestingly enough, for the cyano group (-CN), a preference of 4.3 kcal/mol was calculated - for outward rotation.4 It turns out that the donor π orbitals are more important than the acceptor π* orbitals, which are relatively high in energy. The formyl group only rotates inwards because it has an exceptionally low-lying π* orbital! 1. Kirmse, W.; Rondan, N. G.; Houk, K. N. Stereoselective substituent effects on conrotatory electrocyclic reactions of cyclobutenes. J. Am. Chem. Soc. 1984, 106 (25), 7989–7991. DOI: 10.1021/ja00337a067. 2. 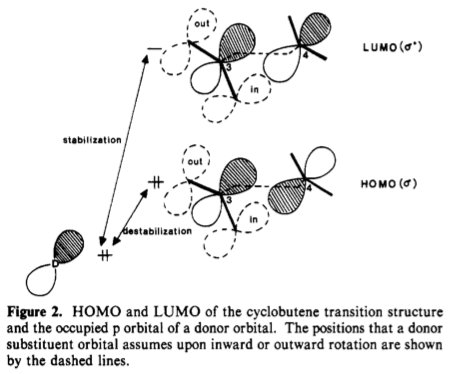 Rondan, N. G.; Houk, K. N. Theory of stereoselection in conrotatory electrocyclic reactions of substituted cyclobutenes. J. Am. Chem. Soc. 1985, 107 (7), 2099–2111. DOI: 10.1021/ja00293a046. 3. 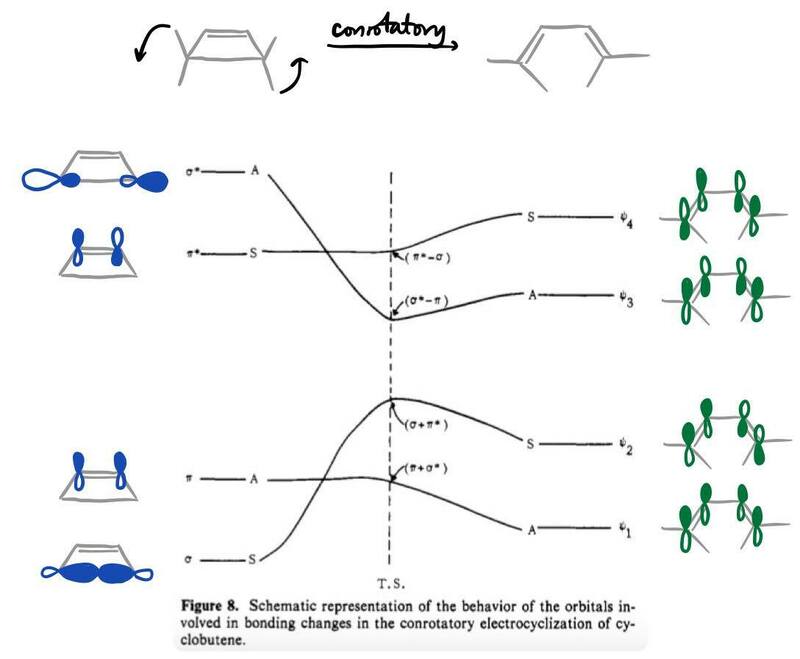 Houk, K. N.; Spellmeyer, D. C.; Jefford, C. W.; Rimbault, C. G.; Wang, Y.; Miller, R. D. Electronic control of the stereoselectivities of electrocyclic reactions of cyclobutenes against incredible steric odds. J. Org. Chem. 1988, 53 (9), 2125–2127. DOI: 10.1021/jo00244a058. 4. Rudolf, K.; Spellmeyer, D. C.; Houk, K. N. Prediction and experimental verification of the stereoselective electrocyclization of 3-formylcyclobutene. J. Org. Chem. 1987, 52 (16), 3708–3710. DOI: 10.1021/jo00392a047. Not the answer you're looking for? Browse other questions tagged organic-chemistry pericyclic stereoelectronics stereoselectivity or ask your own question.